Is there a more iconic symbol of 20th Century American manufacturing than the Gran Torino? If there is, it’s the 1911 handgun. Four decades ago, both stood at the top of the mountain. The American Muscle Car and the custom 1911. Race car and race gun. The big block and carburetor, the single stack and hardball. Chrome and steel. Times have changed but these symbols endure. 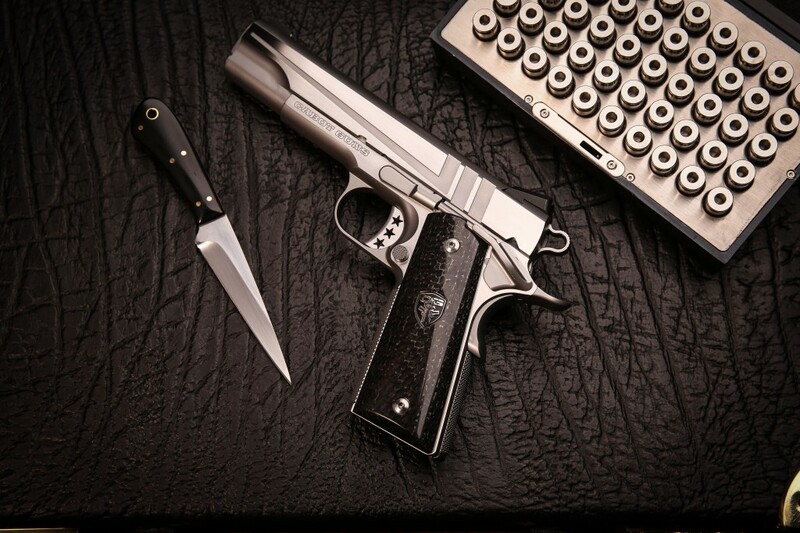 Cabot Guns melds these two classics into a single retro-themed handgun with the Gran Torino SS 1911. Inspired by a one-of-a-kind custom project, the original Cabot Gran Torino 1911 was met by such enthusiasm by our customers that the decision was made to produce this new American classic, The Gran Torino SS . From muzzle to magazine well, this 1911 exudes speed, power and motion. The Gran Torino SS is constructed completely from stainless steel, with the notable exception of the chatoyant carbon fiber grips. This exclusive material was crafted specifically for use on the Gran Torino SS and, like the metallic paint jobs of the 70s muscle cars, contains flakes of luminescent silver. As the gun moves, the light from the grip panels dazzles. The vector-style racing stripes that graced the flanks of the classic automobile are milled into the handgun’s slide as cocking serrations with the gun’s flats hand-polished to a level of visual perfection that no machine can match. Like all Cabot Guns, the Grand Torino is built to exacting tolerances by some of America’s most talented craftsmen. 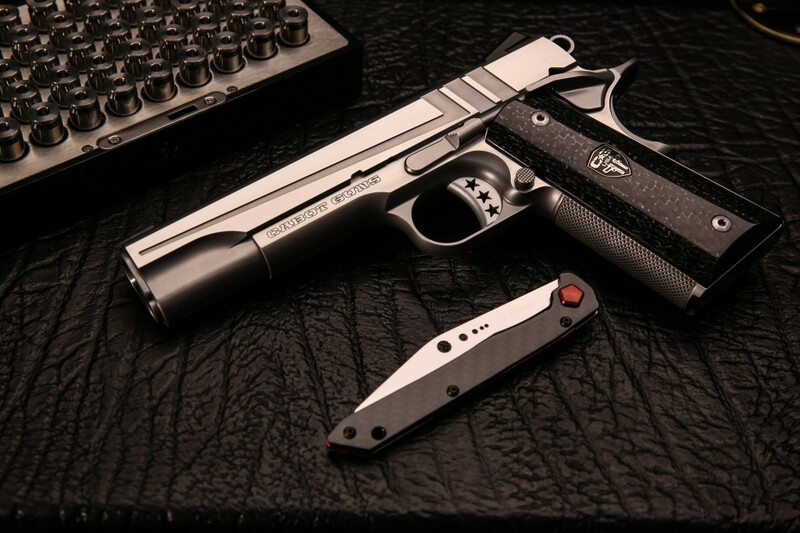 This full-size 1911 is available in the customer’s choice of .45 ACP or 9x19mm with functional upgrades that maximize the best elements of the unsurpassed design. The Gran Torino is designed to shoot the way that it looks, with performance that will turn heads. Every Cabot Gun is built with the precision and accuracy that has made the company’s name a dominant force in national matches. The extended beavertail grip safety puts the gun high in the hand to control recoil and the safety is right where the subconscious mind wants it to be. The impeccably textured Rhombus front strap mainspring housing are inspired by automotive tire tread traction control design to provides a solid grip surface. Every detail has been carefully considered. Like all Cabot Guns, the Gran Torino was born from a block of 100% American made hot rolled billet steel. The steel that built both Detroit’s automobiles and America’s historic gunmakers with unapologetic grit. This 1911 represents the end of an era, before analog became digital, before steel became plastic. There are no powdered metal parts, no polymer components, no cut corners. This gun was built by shooters, not accountants. The golden era of 20th Century American craftsmanship endures in the Gran Torino SS.